When Jenifer Apazidis’ mother was diagnosed with early-onset Alzheimer’s, she noted that the dining experience became a challenge due to her special needs. Following her mom’s death, Jenifer opened a restaurant in her honor and began offering a monthly luncheon, “Lovely Linda’s Lunches,” for caregivers and their loved ones living with Alzheimer’s and dementia. The social lunches were so successful, Jenifer was inspired to start a program catering to all people living with mental and physical impairments. 1. What was the inspiration behind Purple Table Reservations? In early 2017 we had an experience with a guest who had a child with Autism and requested certain accommodations to make their dining experience successful. Reflecting on this reservation, I realized how few and far between these requests were, because dining out is simply too unpredictable and often too stressful for those with certain cognitive and physical conditions. I realized that knowledge is power. That is when we created the discreet reservation flag “Purple Table” and an initial rudimentary training for our staff at our restaurant. I knew if we educated and trained our staff with the tools and knowledge to succeed, we would be able to offer a new level of service. The program was so successful at our restaurant that we evolved it into a service all restaurants can now offer.The Purple Table Reservations directory, training system and mobile app launched in September of 2017. 2. Why is Purple Table needed in today’s society and how does it make a difference? Aside from becoming a more inclusive society, we need to recognize the value in social experiences for those living with a condition such as Alzheimer’s or Autism and the family members and friends who care for them. An enjoyable, stress-free dining-out experience is something most of us take for granted. However, for someone who gets easily confused or over-stimulated, the experience can quickly turn into a stressful event. This is why people often stop dining out all together. So, when you have a staff member that is aware of someone’s basic needs and has our training, they will keep the experience as predictable, positive and stress-free as possible. 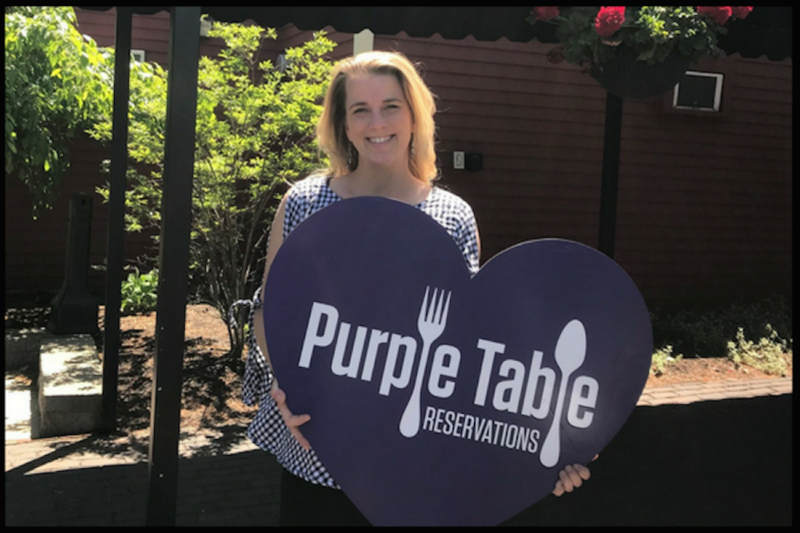 Guests (families) looking for a Purple Table experience can search for restaurants on our website or mobile app geographically, request a reservation (indicating a Purple Table) via the restaurant’s reservation system or by phone/email. Before the guests arrive, the restaurant has already mapped out their experience. Some examples of accommodations include specific tables/areas that are reserved for the guest (well lit, close to entrance, not close to any areas that could be over stimulating), a designated staff member (server/manager) that will manage the reservation from start to finish, notifying the kitchen of the Purple Table which may include special requests. Depending on the guest, the server will streamline service as to not offer too many choices, pay close attention to social cues and the guests’ particular needs. For example, for someone who is living with dementia, we often can help guide them when ordering, picking up on likes and dislikes and allowing them the independence of ordering for themselves. 4. What is the process for a restaurant to sign up to accept Purple Table Reservations and what training do the restaurants receive? 5. What How large is your community and how can volunteers/restaurants become involved? As this is such a new concept, we know it is going to take time and resources to bring Purple Table Reservations to every community. However, we are so excited that we have twenty restaurants in four states from Massachusetts to Washington! We have about 10 more that are in the process of signing up. Some members that did our initial six-month trial have already renewed for the next year. We launched a Community Ambassador program in early 2018 that allows people to register to be a Community Ambassador and gain access to educational materials so they can spread the word in their communities. We also have been forming partnerships with city/town organizations that want to bring Purple Table Reservations to their communities, and help onboard the restaurant on a local level. For more information about Purple Table Reservations, go to www.purpletables.com/.